Specifically, the researchers argue that the impact likely triggered most of the immense eruptions of lava in India known as the Deccan Traps, explaining the "uncomfortably close" coincidence between the Deccan Traps eruptions and the impact, which has always cast doubt on the theory that the asteroid was the sole cause of the end-Cretaceous mass extinction. "If you try to explain why the largest impact we know of in the last billion years happened within 100,000 years of these massive lava flows at Deccan … the chances of that occurring at random are minuscule," said team leader Mark Richards, UC Berkeley professor of earth and planetary science. "It's not a very credible coincidence." While the Deccan lava flows, which started before the impact but erupted for several hundred thousand years after re-ignition, probably spewed immense amounts of carbon dioxide and other noxious, climate-modifying gases into the atmosphere, it's still unclear if this contributed to the demise of most of life on Earth at the end of the Age of Dinosaurs, Richards said. "This connection between the impact and the Deccan lava flows is a great story and might even be true, but it doesn't yet take us closer to understanding what actually killed the dinosaurs and the 'forams,'" he said, referring to tiny sea creatures called foraminifera, many of which disappeared from the fossil record virtually overnight at the boundary between the Cretaceous and Tertiary periods, called the KT boundary. The disappearance of the landscape-dominating dinosaurs is widely credited with ushering in the age of mammals, eventually including humans. He stresses that his proposal differs from an earlier hypothesis that the energy of the impact was focused around Earth to a spot directly opposite, or antipodal, to the impact, triggering the eruption of the Deccan Traps. The "antipodal focusing" theory died when the impact crater, called Chicxulub, was found off the Yucatán coast of Mexico, which is about 5,000 kilometers from the antipode of the Deccan traps. 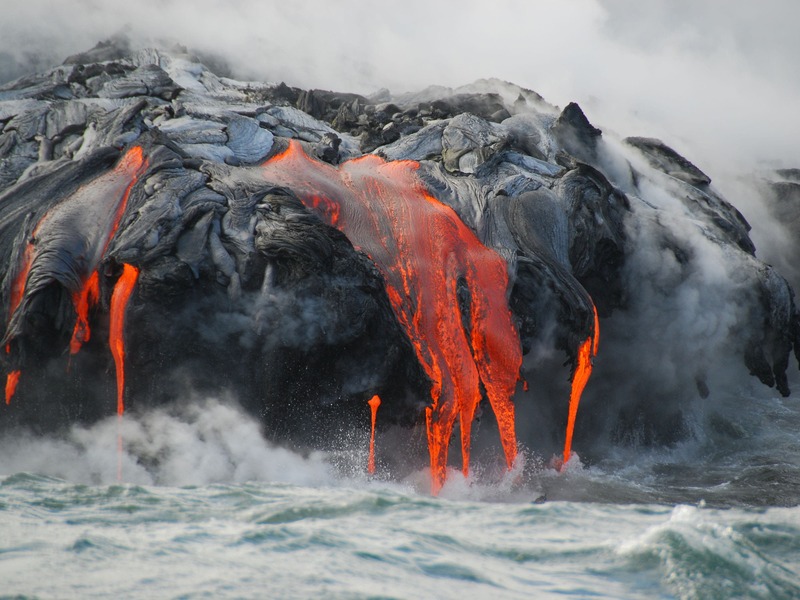 Richards proposed in 1989 that plumes of hot rock, called "plume heads," rise through Earth's mantle every 20-30 million years and generate huge lava flows, called flood basalts, like the Deccan Traps. It struck him as more than coincidence that the last four of the six known mass extinctions of life occurred at the same time as one of these massive eruptions. "Paul Renne's group at Berkeley showed years ago that the Central Atlantic Magmatic Province is associated with the mass extinction at the Triassic/Jurassic boundary 200 million years ago, and the Siberian Traps are associated with the end Permian extinction 250 million years ago, and now we also know that a big volcanic eruption in China called the Emeishan Traps is associated with the end-Guadalupian extinction 260 million years ago," Richards said. "Then you have the Deccan eruptions – including the largest mapped lava flows on Earth – occurring 66 million years ago coincident with the KT mass extinction. So what really happened at the KT boundary?" Michael Manga, a professor in the same department, has shown over the past decade that large earthquakes – equivalent to Japan's 9.0 Tohoku quake in 2011 – can trigger nearby volcanic eruptions. Richards calculates that the asteroid that created the Chicxulub crater might have generated the equivalent of a magnitude 9 or larger earthquake everywhere on Earth, sufficient to ignite the Deccan flood basalts and perhaps eruptions many places around the globe, including at mid-ocean ridges. "It's inconceivable that the impact could have melted a whole lot of rock away from the impact site itself, but if you had a system that already had magma and you gave it a little extra kick, it could produce a big eruption," Manga said. Similarly, Deccan lava from before the impact is chemically different from that after the impact, indicating a faster rise to the surface after the impact, while the pattern of dikes from which the supercharged lava flowed – "like cracks in a soufflé," Renne said – are more randomly oriented post-impact. "There is a profound break in the style of eruptions and the volume and composition of the eruptions," said Renne. "The whole question is, 'Is that discontinuity synchronous with the impact?'" "This was an existing massive volcanic system that had been there probably several million years, and the impact gave this thing a shake and it mobilized a huge amount of magma over a short amount of time," Richards said. "The beauty of this theory is that it is very testable, because it predicts that you should have the impact and the beginning of the extinction, and within 100,000 years or so you should have these massive eruptions coming out, which is about how long it might take for the magma to reach the surface." Since the team's paper was accepted for publication, a group from Princeton University published new radioisotopic dates for the Deccan Traps lavas that are consistent with these predictions. Renne and Sprain at UC Berkeley also have preliminary, unpublished dates for the Deccan lavas that could help solidify Richards' theory, Renne said.